CHILLICOTHE (52) — Z.Ford 0 (0) 1-2 1, M.Green 5 (0) 2-4 12, J.Hall 0 (4) 0-0 12, A.Barnes 0 (0) 1-2 1, S.Smith 8 (0) 0-0 16, H.Price 1 (2) 0-0 8, M.Johnson 1 (0) 0-0 2. TOTALS: 15 (6) 4-8 52. HILLSBORO (31) — M.Cosby 3 (0) 0-0 6, G.Dean 4 (0) 0-0 8, K.Burns 1 (2) 0-0 8, L.Grover 0 (2) 1-2 7, K.Hopkins 0 (0) 2-4 2. TOTALS: 8 (4) 3-6 31. FRANKFORT — Though the Hillsboro Lady Indians still have one regular-season game left on their schedule, their tournament road ended on Monday night, falling to the Chillicothe Lady Cavaliers, 52-31 at Adena High School in their Division II SE District Sectional Semifinal game. Hillsboro now stands at 4-18 overall following the loss. The game was closely played through the second through fourth frames, but the biggest difference in scoring was the first quarter when the Lady Indians were outscored 11-0 by the Lady Cavaliers, as this was the third time this season CHS defeated Hillsboro. That frame saw Chillicothe score the first points off a basket by Meliah Johnson, followed by a free throw by McKenzie Green and a layup by Shawnice Smith to lead 5-0 less than three minutes in the contest. Smith led all scorers with 16 points. Next came a 3-pointer by Green, then as the quarter continued there were points in the paint by Green again. tThe scoring for the first quarter ended with Zoe Ford sinking a free throw. Green ended the game with 12 points. CHS eventually built their lead to 16-0 by opening the second quarter with back-to-back baskets by Smith and then a converted free throw by Aries Barnes with 3:54 left in the second frame. “We looked at our shot chart at halftime, and the shots were there, but we were just not knocking them down,” HHS head coach JR Moberly said. “A lot of that I attribute to nerves and just trying a little bit too hard. You have to be relaxed when you are shooting and be a little bit carefree, and we just weren’t that early on. Hillsboro scored the first of the their five points for the second quarter with a jumper by Gracie Dean, and after two more points by CHS — off a basket from Green — Hillsboro had a jumper swish through the hoop by Mackenzie Cosby. Dean co-led HHS with eight points and Cosby totaled six points. The final point of the second came with a free-throw by Lana Grover with 3.9 on the clock, with HHS trailing 18-5 at halftime. Grover finished the game with seven points. The Lady Indians played much closer in the second half, beginning the third with two points from Kelsey Burns. As the quarter continued, Cosby battled in the paint for a basket to get the Lady Indians within 11 points of the Chillicothe lead with 6:54 left in the third. The Lady Cavaliers came back with a 3-pointer by Grover, and later Dean sank a jumper. Grover made a 3-pointer with 1:45 left on the third-quarter clock, but that same basket was answered with a trey by Hayden Price for the 33-17 score once the third frame came to a close. 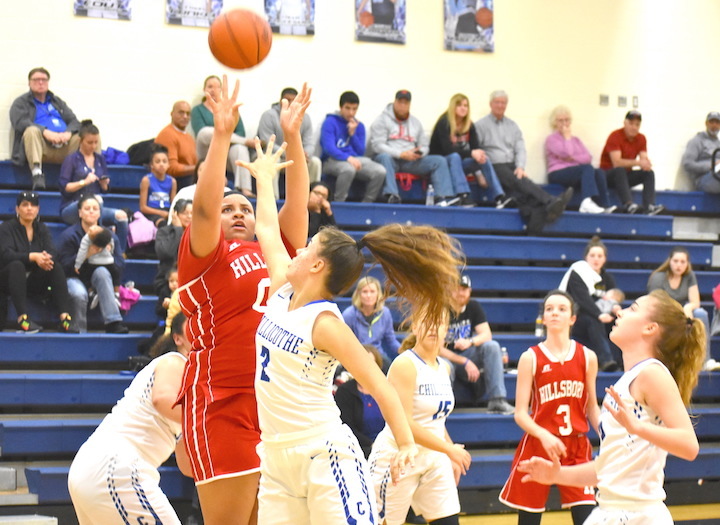 Chillicothe outscored the Lady Indians, 19-14 in the fourth with Burns — who also co-led HHS with eight points — opening the quarter with a 3-pointer. Later, Karleigh Hopkins sank a free throw, and as the quarter continued it was Dean who scored two points on a layup for HHS. Also for CHS, Julie Hall finished with 12 points, making four 3-pointers in the second half. Dean came back with another two-point basket with 4:51 on the clock, and Burns sank her second 3-pointer of the fourth quarter at the 4:00 mark, as HHS trailed by a 45-28 score. Hopkins — who finished with two points — sank another free throw, and Dean scored the final HHS points of the postseason game with a basket at the 2:55 mark of the final frame. For the game, CHS made 15 two-point baskets, five 3-pointers and were 4-of-8 from the free-throw line. 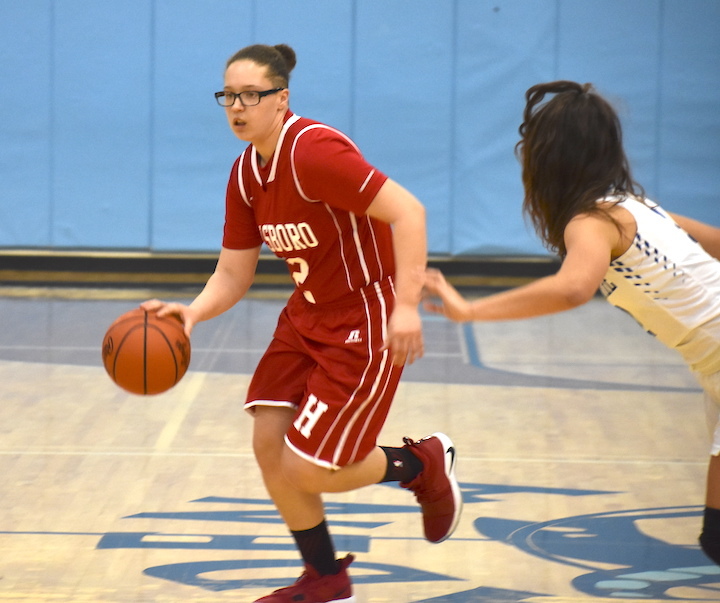 HHS finished with eight two-point baskets, four 3-pointers and they were 3-of-6 from the free-throw line. Seniors playing in their last tournament game were Lana Grover, Mackenzie Cosby and Kelsey Burns. “Lana, I remember her walking into my first camp as the girls basketball coach when she was in the third grade, and she’s been with me the whole time,” Moberly said. “When we run drills in practice and are forcing on technique, I just say ‘look over at Lana, she’s going to do it right the first time.’ She’s going to do it right every time, and she does everything we’ve asked her to do. She’s set the example. She’s battled with injuries. At Greenfield on Saturday, she made a 3-pointer and could barely lift her arm, but she was open and she was going to make it. “Kelsey Burns, I’ve been so pleased and impressed by her. I have so much respect for her with the effort she’s put into her game and the leadership she’s shown. It is a different kind of leadership with Kelsey, but it is important leadership ,and she’s just been so important for us. Night-in and night-out, she’s going to guard the best player on the other team. She also brings the ball down the floor, and she’s willing and able to do what we need her to do. She’s just done a tremendous job for us all season long, and I can’t speak enough of Kelsey. “Mackenzie wasn’t with us last year but got a hold of me this summer and said ‘I’d like to try this again.’ She came back and put in a lot of time over the summer and worked hard in practice every day. She didn’t get a lot of opportunities until the season began winding down, but when she did get her opportunities she made the most of it. That is a perfect example of those kids who sit toward the end of the bench and not getting the chance they’re looking for, at some point the opportunity is going to come and you have to make the most of it, and that is what Mackenzie has done. 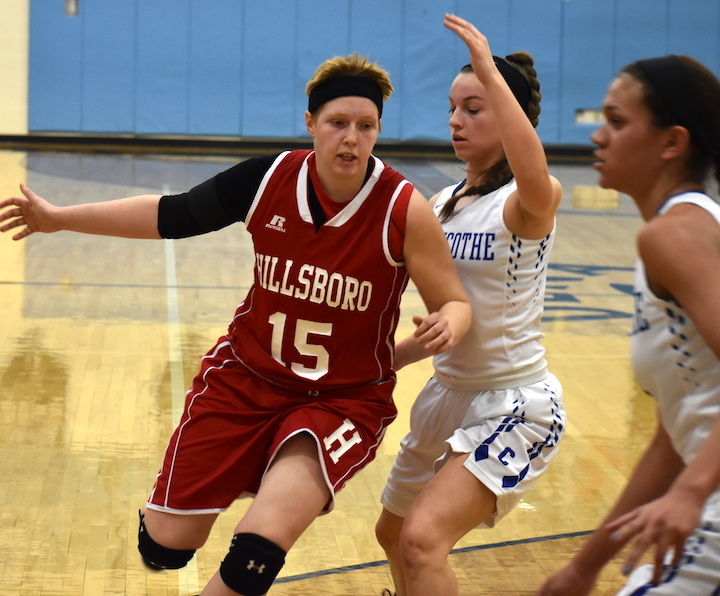 The Lady Indians have one regular-season makeup game left on their schedule as they will take on the Jackson Ironladies on Wednesday, Feb. 13 at HHS in a Frontier Athletic Conference game. “Having one game left makes the locker room a little different after a tournament loss because you know you still have that one out there,” Moberly said. Chillicothe will play Circleville in the sectional final game on Saturday, Feb. 16 at AHS.